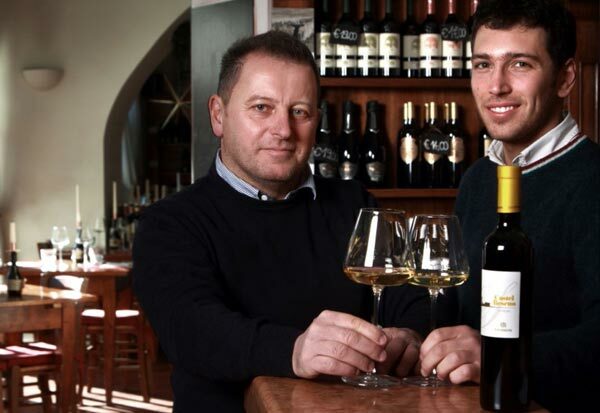 Founded in 1986 by Valter's passion in cultivating its fields and producing a wine that reflects the reality of the territory, the company has now reached important levels of quality. The five hectares of vineyards extending in the municipalities of Calliano, Nomi and Isera are cultivated with the double and simple pergola breeding system. The cellar is made in the ancient Valentini Palace of the eighteenth century, where the vinification and refinement are carried out in small oak carats. The aroma is intense, with scents ranging from ripe exotic fruit to rose, on a background of acacia flowers, ending on an elegant citrus. It is produced from the best Rulander grapes, cultivated in particularly suitable vineyards on the slopes of Castel Beseno. The slightly rosé colour makes it unique, providing a visual anticipation of its fruity, aromatic flavour. A prestigious red wine, Lagrein is capable of exciting even the most refined palates, thanks to the complexity of its fragrances of ripe fruit, its well-balanced structure and tonicity that make it unique in its genre. "Laurentius ", an important red that takes its name from San Lorenzo, the patron saint of Galliano. The colour is an intense straw yellow, with golden glints, and the fragrance intensely aromatic, with scents ranging from golden apple to ripe, delicate and fragrant peach. This dessert wine is unique in its kind.